Item is a photograph of the escarp wall of Casemates 6 and 7R from right shoulder angle. Item is a photograph of a cavern found between Casemates L3 and L4. Item is a photograph of the right flank, escarp wall. Item is a photograph showing the cardon stone on the angle of the Escarp Wall. 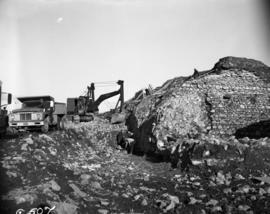 Item is a photograph of personnel constructing forms for the base of the Escarp Wall, facing North West. Item is a photograph of the construction of winter sheds on the Escarp Wall. Item is a photograph of a crew of surveyors from the Department of Northern Affairs. Item is a photograph of the corewall, taken from the counter escarp. Item is a photograph of the detail of wood in mortar on the right flank escarp wall, outside Casemate R6. Item is a photograph of the drain behind Casemate L1. Item is a photograph of staff members removing cut stone from the drain of Casemate L1. Item is a photograph of the Escarp wall facing North East and West. Item is a photograph of the escarp wall workmen. Item is a photograph of the construction of a shed surrounding the left flank Escarp Wall. Item is a photograph of the escarpment and wall. 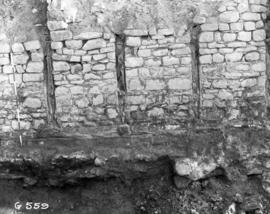 Item is a photograph of excavations of the Escarp Wall in back of the left flank casemates. Item is a photograph showing the extension of the core wall of the Escarp from the right flank angle. Item is a photograph of a flanked angle of the Escarp wall. Item is a photograph of a flanked angle of the Escarp wall looking North. Item is a photograph of the footing of the left face escarp wall, taken from the bridge during the reconstruction of the Fortress of Louisbourg. Item is a photograph of a general view looking North, showing the left face Escarp Wall. Item is a photograph of cobble stone in the King's Bastion.